Dog demonstrates the ability to hold a stay while handler places a food or toy distraction approximately 5-10 ft. (1.5 – 3 m) in front of dog, returns to dog for 2 seconds and then dog moves when given a release cue. Purpose: Demonstrate impulse control and the ability to remain stationary with distractions. Equipment: Toy or a bowl (optional) with treats. Exercise set-up: Dog is placed in a sit or down. The exercise begins when the handler cues the dog to stay, places the bowl approximately 5 to 10 ft. (1.5 – 3 m) in front of the dog, and returns to heel position. The dog must remain stationary for 2 seconds, after which the handler may release the dog toward the bowl, using a verbal cue and/or signal. Alternatively, the handler may bring the bowl back to the dog and then release the dog. The exercise ends when the dog gets up on the release cue. Non-qualifiers: Dog does not hold position while the distraction is placed on the ground. Dog breaks out of position before being released. Dog does not get up when released. Video does not permit exercise to be adequately judged. 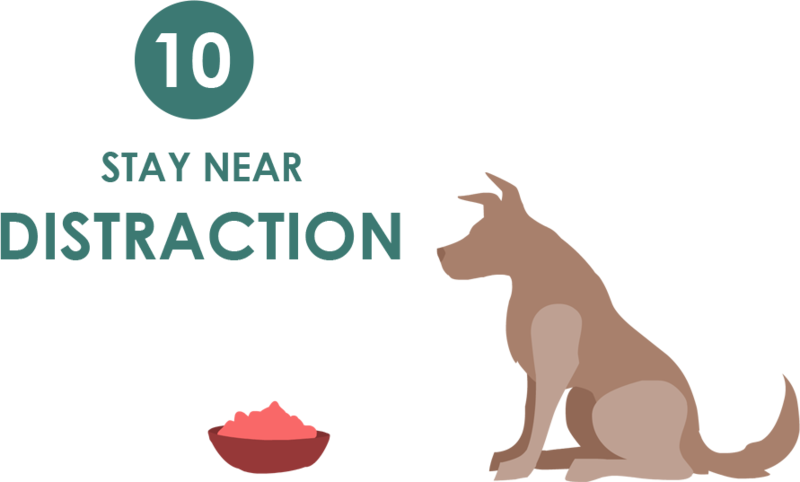 Tip: Remember that your dog must move when given the release cue!